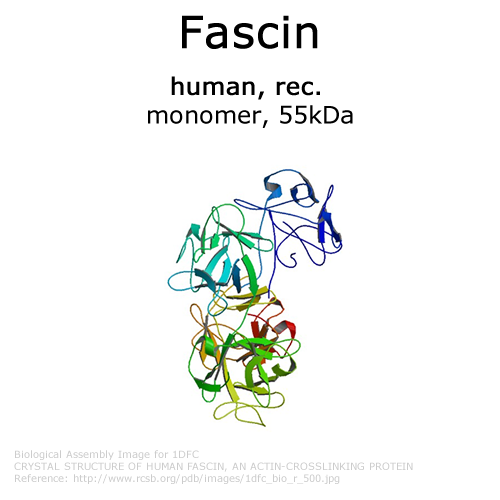 Fascin is a monomeric actin bundling protein with a molecular mass of 55kDa. 150mM NaCl, 20mM Hepes pH 7.4, 1mM DTT and 5% sucrose, when reconstituted with 50 µl ultrapure water to obtain a 1.0 mg/ml solution. Purity: >99% by scanning densitometry from Coomassie G-250 stained SDS-Gels. Bundling activity: 2µM Atto565-Actin (Cat.#:8162-01) was incubated with Fascin at a molar ratio of 1:10 and 1:4.1 to verify bundling by fluorecence microscopy. All proteins were used as supplied, i.e. without dialysis. The actin stock solution was pre-spun 15min, 15.000xg, 4°C. Low speed cosedimentation assay was performed (20,000xg, 30min) with rabbit skeletal muscle actin (Cat.#:8101-03) in the presence of sugars. At a molar ratio of 4. : 1 (actin : fascin), fascin was mixed with F-actin. After 30min at RT, the samples were used for low speed spinning. SDS-PAGE showed, that fascin was completely pelleted with F-actin. Fascin protein was amplified from human macrophage cDNA and expressed as a GST-tag fusion protein in E. coli. After purification by GST-Agarose and subsequent GST-tag cleavage, the pure protein was yielded by gel filtration chromatography. 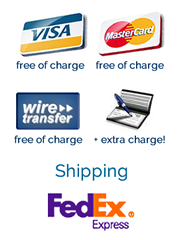 Fascin is stored at –70°C upon arrival will be stable in performance for at least 6 months from the date of purchase. The solubilized protein is kept on ice and should be stored at -20°C in glycerol or CryoProtect (Cat.#: 6011-01). Avoid repeated freeze / thaw cycles. Structure, evolutionary conservation, and conformational dynamics of homo sapiens fascin-1, an f-actin crosslinking protein.